So I’ve always loved fruit tarts,whether individual tiny ones that can be almost like a petit-four or a bigger cake-size one. The fact that they come with a topping of fresh fruits rather than heavy icing like so many cakes, is what I think makes them attractive to me. Anyways, I found the recipe in one of my favorite baking books (Step-by-Step Baking by Caroline Bretherton) and thought I give it a go. You know I thought of every possible scenario: the tart shell will probably break, the creme patisserie won’t taste right,etc etc! But, despite my expectations, it was absolutely perfect! It came out of the tart pan easily without even cracking and the creme patisserie tasted incredible! I should give credit to the amazing Stephanie Jaworski of joyofbaking.com. 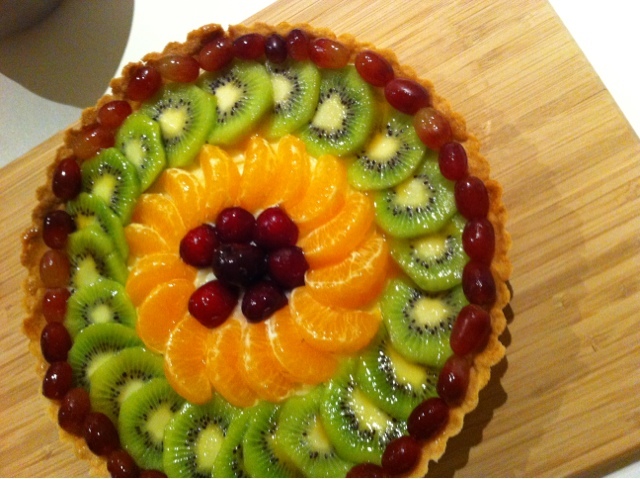 Although, I didn’t follow her recipe, I watched her video on fruit tart several times and used all the tips she gave in it. 1- In a bowl, combine the flour and butter and rub them together with your hands until they resemble fine bread crumbs. 2- Then, add the sugar and mix. 3- Add the vanilla to the egg yolk, combine and then add it to the flour mixture. 4- Combine the ingredients until they form a dough. Then wrap in cling film and leave it in the refrigerator for 1 hour. 5- Preheat your oven to 180c. 6- Flatten the dough with your hands a little bit. At this stage I took advice of Stephanie of joyofbaking.com and just placed the dough in a buttered tart pan ( instead of rolling it), and using my fingers flattened the dough to the shape of the tart pan. 7- Use a fork to prick the pastry base. 8- Line the pastry with a baking paper and place baking beans over the paper. 9- Bake in oven for 20 minutes. 10- Remove the beans and bake again for a further 5 minutes until you can see the edges are light golden. 11- Remove from oven, and while hot, brush the pastry with melted apricot jam. ( I first brushed the pastry with whisked egg white and then with apricot jam. This step just makes sure your pastry doesn’t become moist when you add the creme patisserie). 12- Let the pastry shell cool completely at room temperature. Do not remove from pan yet. 13- For the creme patisserie, beat the sugar,vanilla extract, corn flour, and sugar together in a bowl. 14- In a pot, heat the milk and just as it starts to boil, remove it from heat. 15- While whisking the egg mixture constantly and vigorously, add the hot milk to it. 16- Return the mixture to the saucepan and place on medium heat. REMEMBER : Whisk constantly! 17- Once the mixture starts to thicken, reduce the heat and continue to whisk for a few more minutes. 18- Transfer the hot mixture to a bowl, and cover the whole mixture with cling film ( not just the top of the bowl, push the cling film down to actually cover the mixture. This is again another tip from Stephanie of joyofbaking.com ). 19-Let the creme patisserie cool completely at room temperature. 20- To assemble, beat the creme patisserie if it has hardened a bit, then spread it in the pastry shell. Next, arrange your favourite fruits on top in whatever pattern you like and brush with melted apricot jam. Finally, gently remove from the tart pan. 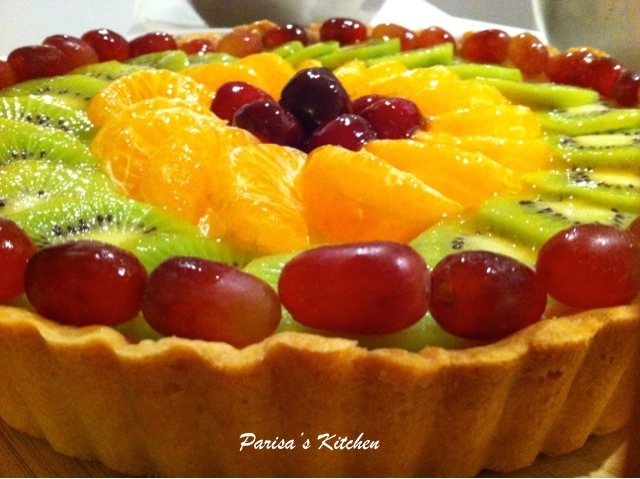 Posted in Cuisine, Food, International, TartTagged baking, fruit tart, recipe, tartBookmark the permalink. This looks absolutely delicious for a first tart. Thanks for stopping by. Have a lovely week! Looks amazing and so delicious! So beautiful ! Great recipe ! I’d try with peaches, plums, apricots and nectarines ! This tart looks like it was bought at a top notch bakery. Great job. I will try it in future. Your first fruit tart was a hit. It looks very nice!!! !